Ladies Selections – Our selections include flat front, microfiber, and tuxedo short selections, as well as great skirts and shorts to allow your female staff members to not feel too warm while they work. Men’s Selections – Khaki shorts, loose-fitting pants, and casual selections that look great on every male staff member is what we offer. You can choose these great options for any of your servers or spa workers to make them feel comfortable while they work outside. Now that you know about our newest pants, skirts, and shorts, it’s time to place an order. 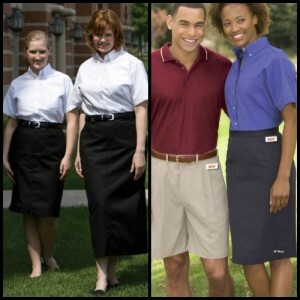 Sharper Uniforms is proud to provide some of the best restaurant uniforms on the Internet. Furthermore, our stock includes wonderful selections that are perfect for your hotels, bars, coffee shops, and more.